Dragon’s Lair 2: Time Warp is an arcade classic. The iOS version is the same experience with it having everything the arcade version had, and more. There really aren’t graphics in Dragon’s Lair 2: Time Warp. It’s an animated short made by the same animator who worked on 101 Dalmatians and Beauty and the Beast. They look like Retro Disney which is great. You really can’t review the graphics on this game but the video is fantastic. 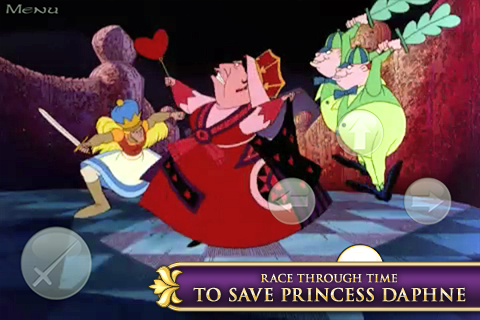 The gameplay in Dragon’s Lair 2: Time Warp is very unique. You are watching a 10 minute video while pressing the correct buttons to advance. There is a sword icon on the left side of the screen and a directional pad on the right. As soon as one of them turns yellow you must tap it. The animation then continues. This takes great hand eye coordination. If you want to make the game very hard for yourself there is an option for how many lives you want and an options to turn of the yellow icons so you have to do it by the flashing item on the animation. Unlike the arcade version of the game you can save and come back to the last save that happened. The game plays fantastic and is very easy to get into. The game costs $2.99 in the App Store. This is a little steep for the amount of content they give you. There is, however, a directors cut of the story which is not a lot different. But if you wanna see if you can do it in 1 life without any directions, then it’s gonna have a lot of replay value. The games user interface is alright. There is an attack button that has a sword on it on the left side of the screen, and a directional pad on the right side of the screen. They are semi transparent and the size of them can be adjusted in the options menu. The only problem I had been that too often I found myself staring at the controls waiting for the next yellow mark to pop up and I wasn’t seeing the action going on in the animation. This is not a big deal but it can be frustrating. The sound in Dragon’s Lair 2: Time Warp is exactly like it was in the arcade release. It sounds great and it has great sounds when you die and when you navigate the menu. 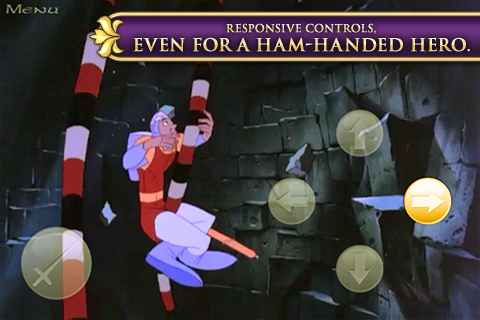 For $2.99 Dragon’s Lair 2: Time Warp is a little pricey and the controls also get in the way of the excitement. But other than that, the game is great and fun to play. The animation is fantastic and the game is fun to play. I give it an 8/10. Entries (RSS) | Comments (RSS) | 91 queries in 0.804 seconds.